An electric car that uses zero gallons of gasoline annually deserves an “A.” Does the average car that now demands 600 gallons per year deserve a “B” in 2012? We’ll never get to those 2016 CAFÉ standards by letting everything with four wheels slide through. The DOE provides wonderful models to calculate the lifecycle emissions of a vehicle from either source-to-wheels with GREET 1.x or include the lifecycle emissions including the supply-chain that went into making the vehicle using the GREET 2.x model. Let’s hope that the new website includes both. Let’s hope that grades “A” through “F” are based on lifecycle emissions, using GREET 1.7 as a minimum. I’m all for cars that emit less than 4 tons of CO2 per year getting an “A,” but emit 16 tons per year and you should get an “F” and that includes corn-guzzlers. The Department of Transportation’s 2010 Climate Impacts report to Congress also effectively compared the emissions of different fuels and drive systems. One proposed sticker includes a grade, one does not. For electric cars, such as the Nissan LEAF and Ford Focus Electric, the new labels will estimate annual electricity cost based on 12 cents per kWh; 5 year savings estimate; range; kWh per 100 miles; MPG equivalents and comparison to other electric cars; and show zero tailpipe emissions. Plug-in hybrid labels for cars such as the Chevy Volt and Toyota Prius Plug-in will include 5-year savings estimate; electric + gas combined MPGe; gasoline only MPG; and comparisons with other plug-in hybrids. For hybrids and conventional cars, such as the Honda Insight and Mini Cooper, the new labels will estimate annual fuel cost; MPG for city, highway, combined, and compared with others in class; CO2 emissions (tailpipe only); and emissions compared with others in class. All labels will make it easy to use an Internet browser or smart phone scan to get more details. If the letter ratings are adopted, they will be based on combined CO2 emissions and mileage equivalent. All new cars and light-duty trucks sold in the U.S. are required to have a label that displays fuel economy information that is designed to help consumers make easy and well-informed comparisons between vehicles. Most people recognize the current label (or “window sticker”) by the gas tank graphic and city and highway MPG information. EPA has provided fuel economy estimates in City and Highway MPG values for more than 30 years. 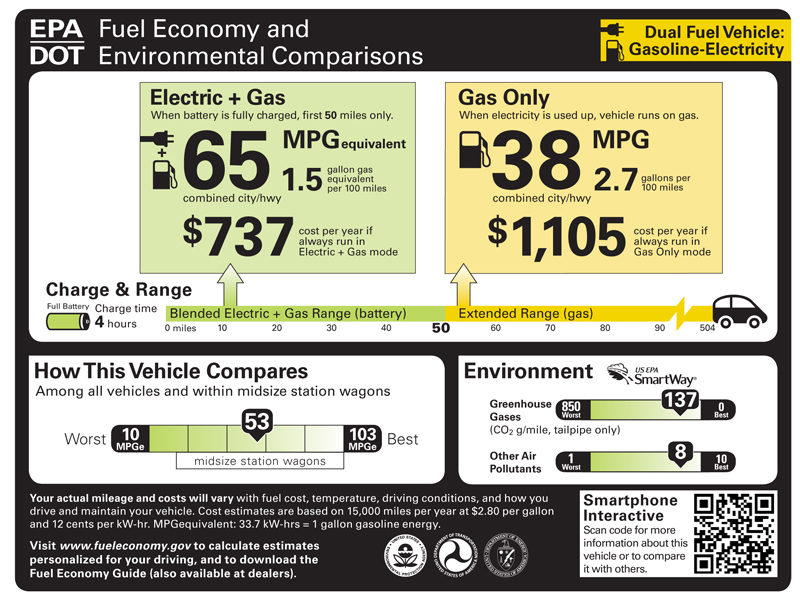 EPA and the National Highway Traffic Safety Administration (NHTSA) are updating this label to provide consumers with simple, straightforward energy and environmental comparisons across all vehicles types, including electric vehicles (EV), plug-in hybrid electric vehicles (PHEV), and conventional gasoline/diesel vehicles. The agencies are proposing two different label designs and want public input. Specifically, which design, or design features, would best help you compare the fuel economy, fuel costs, and environmental impacts of different vehicles. For more information and to give your feedback.